Originally printed on October 7, 2012. Spoken words from a native Queens cab driver and father of two adult kids as he drove my husband Tommy and me to JFK for a flight back to L.A. just two days after superstorm Sandy slammed the northeastern seaboard, including New York, New Jersey and Connecticut. En route to the airport, he had to find a gas station to fill up so that he could get back home. A big-time shortage of fuel supplies caused traffic jams and long lines. Generators and water-removing pumps also require fuel to operate. 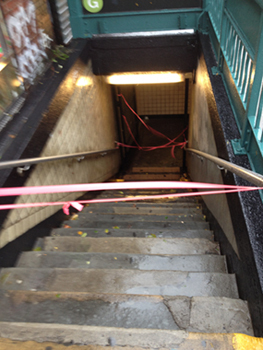 Sandy’s powerful winds, extreme high tides and torrential rainfall struck hard on Oct. 29. Over 8.5 million people spanning many states were initially left without power. We were visiting family in Brooklyn, including our 7-month-old granddaughter, Scout. What was predicted several weeks earlier as light rainfall for the New York area flip-flopped into an unexpected hurricane warning! On the Saturday before the storm, the weather seemed seasonally normal, low 60s with some dark clouds. We did the touristy thing, checking out the High Line Park in the old meatpacking district of Chelsea on Manhattan’s Westside. A short walk from the end of the Metro stop, we passed by trendy shops, restaurants, including Morimoto of “Iron Chef” fame and even a glitzy two-level Apple store. The High Line Park is a recently developed public park designed with flora and fauna along a meandering path that goes on for blocks. On a good day, there is many a photo op here with fall foliage colors, views of architecturally interesting structures, including a Frank Geary-designed building and the Hudson River. Wisely elevated high above ground level on a former rail line, this park was kept safe. The streets below suffered flooding, as water overflowed from the Hudson. Power was lost and finally restored this past weekend. TV news coverage repeatedly showed a four-story Chelsea building without a front facade, literally blown off by high winds. It looked like a movie set, but real people were there, exposed, in the upper two apartments. Sunday was the calm before the storm. We walked a mile to the Home Depot for flashlights. Lines were long here and at the neighborhood market where everyone patiently waited to stock up with water and food. Monday brought rainfall and strong, gusty winds. Sandy was predicted to impact the NYC area around eight that night. We sat hunkered down to the TV, a bit on edge, not really knowing what to expect. Consider us very lucky — safe, sound, with electricity. The aftermath on Tuesday was unbelievably shocking and sad — vivid images of the devastation, destruction, flooding, power outages everywhere. People missing, lives lost, homes destroyed by powerful waters and gas fires, chunks of land lost to the sea, trees uprooted. All major airports, bridges, schools, transportation, Wall Street — closed. Lower Manhattan’s Battery Park, where jaunts to Ellis Island and the Statue of Liberty are offered, suffered flooding at a record high of over 13 feet. Water poured into the two nearby 9/11 memorials and ongoing construction area. It was rescheduled to open yesterday. “Sandy, you broke out hearts” was seen scribbled on a Staten Island downed boat. Over a week later, recovery is under way for the most part, a slow and arduous process that will take time. NYC Mayor Bloomberg continues to provide much needed informative updates. “Live life like there is no tomorrow” is the philosophy of jewelry designer Juri Kameda. Turn back to 2006, when her world went topsy-turvy. Now confined to a wheelchair and respirator, she was diagnosed with amyotrophic lateral sclerosis (ALS), a neuromuscular disease that affects nerve cells in her brain and spinal cord. She is a fighter and adventuresome enough to test all limits. When I last spoke with her, she was going to skydive for the second time to raise funds for awareness and research for ALS, or Lou Gehrig’s disease. Says it’s exhilarating! Born in Tokyo, this bilingual UC San Diego grad studied the cognitive sciences, including artificial intelligence. Her most recent job at Stanford Hospital as a respiratory therapist and practitioner helps her cope with the daily challenges of ALS. Busy is her middle name. Movement is good medicine for her arms and legs, even with weakness in her limbs. Her interest in jewelry making blossomed while on a cruise with hubby Ken. 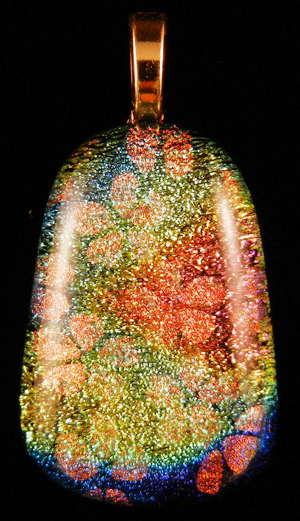 With a stop in Helsinki, Finland, she purchased a glass pendant that eventually led to making dichroic glass pieces. She turned to YouTube and the Web for info gathering. After purchasing a kiln, grinders and cutter, plus lots of trial and error, the rest is history. To achieve that brilliant, reflective glow, three to four micro-layers of glass are fused by spending 20 to 30 hours in and out of the kiln, cutting, grinding and firing in between. Look for more jewelry in small boxes, Asian-style wearables, washi crafts, holiday gift ideas and lots more at the JAMsj’s Winter Boutique this Saturday at the San Jose Buddhist Church gym. On Sunday, the Gedatsu Church welcomes all to their Holiday Craft Faire in South San Gabriel. 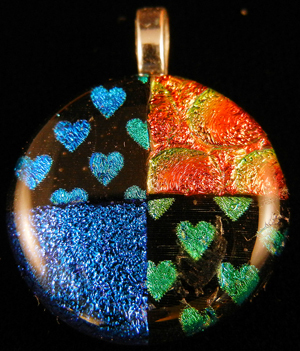 Thank you Gail for the wonderful write up about me and my Dichroic Glass Jewelry. Japan Town Winter Boutique was a hit, and my skydiving from 13,000 feet went very well too. I also appreciate very much spreading the awareness about ALS (also know as Lou Gehrig’s Disease). I will be continuing to enjoy expressing myself through Dichroic glass jewelry making as well as living everyday to the fullest.